The pink-footed goose (Anser brachyrhynchus) belongs to the family of goose, swan and duck, the Anatidae. The pink-footed goose is distributed in northeast North America and northwest and west Europe. This goose species is fully migratory. The goose species is monotypic. The pink-footed goose (Anser brachyrhynchus) is a medium-sized goose, measuring 60 to 75 cm in length and weighing 1400 to 3900 grams. The wingspan is 130 to 170 cm. The pink-footed goose has dark brown head and upper neck. The lower neck is paler with dark striations. The upperparts are grayish brown with very pale barring. The tail is grayish with white tip. The wing coverts are bluish gray and the flight feathers are dark gray. The breast and belly are pale grayish brown. The vent region and the undertail are white. The bill is short, pinkish in color with black base and tip. The legs and feet are pinkish. The irises are blackish. There is a pale brown eye-ring. Their call is a sharp, loud "quik.. quik", "quak.. quak" and "quaak.. quaak" sound. The pink-footed goose is distributed in extreme northeast North America and northwest and west Europe. The breeding populations are distributed in eastern Greenland (Denmark), Iceland and Svalbard and Jan Mayen Islands (Norway). The wintering goose populations occur in Ireland, United Kingdom, Norway, Denmark, Netherlands, Germany, France and Belgium. Vagrant populations of pink-footed goose occur in eastern Canada, eastern coast of USA, Spain, Portugal, Luxembourg, Poland, Austria, Russia, Hungary and Italy. 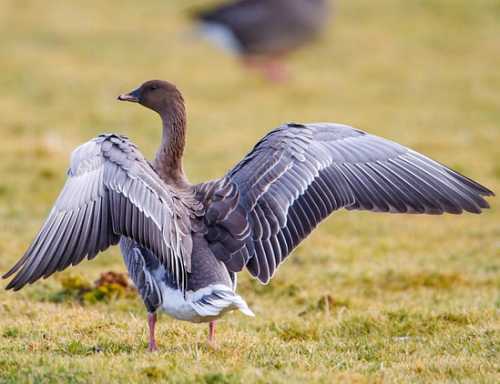 The Important Bird and Biodiversity Areas (IBA) of the pink-footed goose in Greenland are, Albrecht Sletten, Wollaston Forland, Western part of Germania land, Heden, Hochstetter Forland and Ørsted Dal and Coloradodal. The IBA of the goose species in Iceland are, Eyjabakkar, Gudlaugstungur-Álfgeirstungur and Thjórsárver. The IBA in Netherlands are Lake Oudegaasterbrekken and Witte en Zwarte Brekken. The IBA of the pink-footed goose in Svalbard and Jan Mayen Islands (Norway) are, Adventdalen & Adventfjorden, Sassen-Bünsow Land, Bjørnøya, Nordre Isfjorden and Inner parts of Kongsfjorden. The pink-footed goose species does not normally occur in forest. It normally occurs in altitudes between 0 to 100 meters. The artificial ecosystems and habitats include agricultural lands and pasturelands. The natural ecosystems and habitats of the pink-footed goose species include tundra grasslands, cliffs, rocky outcrops, crags, rocky shoreline, estuaries, lagoons and tide pools. The diet of the pink-footed goose species consists mainly of plant matter. Leaves, stems, buds, roots, fruits, seeds, grass, grains and vegetables are their primary food. 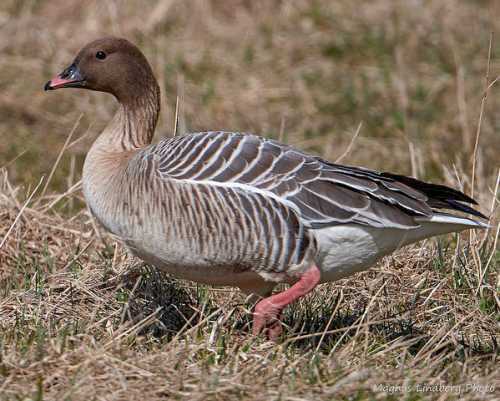 The breeding season of the pink-footed goose species is during May and June in most of their breeding range. They are monogamous and territorial. They may breed in loose colonies. The breeding habitats include cliffs, rocky outcrops, arctic tundra and river-beds. The nest is a low mound of plant matter. The clutch contains three to six pale cream colored eggs with pale gray spotting. The chicks hatch out after 27 days of incubation. The hatchlings are precocial and follow the parents. They fledge after 56-58 days. These pink-footed goose species are fully migratory birds. The breeding populations occur in northeast of North America and north and northwest Europe. The goose species leave the breeding grounds during August-September to winter in Ireland, United Kingdom, Belgium, Netherlands, Germany and Denmark. The return migration to the breeding grounds takes place from mid-April to early May. The global population size of the pink-footed goose (Anser brachyrhynchus) is estimated to be about 410,000 individual birds (Wetlands International 2015). The overall population trend of the species is reported to be increasing. In most of its range, this goose species is reported to be fairly common to common. The generation length is 11.4 years. Its distribution size is about 1,770,000 sq.km. Ecosystem degradation, ecosystem conversion, severe weather, climate change, sport hunting, predation by arctic fox and hunting for food are the main threats that may endanger the survival of the goose species. The pink-footed goose (Anser brachyrhynchus) species does not approach the thresholds for being Vulnerable either under the range size criterion, or under the population trend criterion or under the population size criterion. 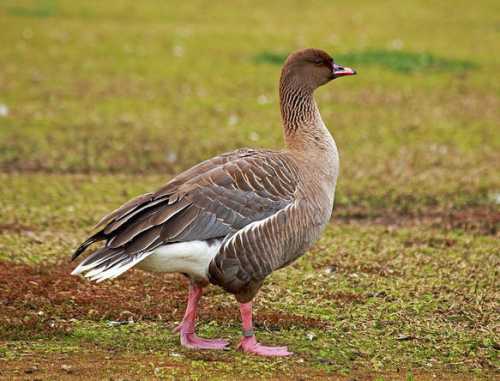 The CITES (Convention on International Trade in Endangered Species of Wild Fauna and Flora) status is ‘Not Evaluated’ for the pink-footed goose (Anser brachyrhynchus). The pink-footed goose (Anser brachyrhynchus) is closely related to the taiga bean goose (Anser fabalis). Recently updated and current topic in Bird World: Pink-footed goose (Anser brachyrhynchus).